Putting their previous week’s heavy defeat at Jedburgh firmly behind them Falkirk put in a fine workmanlike performance in battling out an honours-even drawn match against Musselburgh at Horne Park, last weekend. However, it has to be said, that they could just as easy have won their first League match of the season had their finishing been a bit more accurate and clinical,particularly in the first half. Faring much the better in their early exchanges Falkirk most certainly could not be faulted for their physical effort applied but alas, as it turned out, and slightly against the run of play, Musselburgh took possession and broke away with a try from their outside-centre Andrew Cook in the 15th minute. 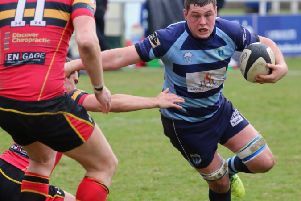 Doubling their tally of points the East Lothian side then went on to score a further try from their Flanker Brad Graham from a five metre ruck in the 41st minute, with stand-off Danny Owenson converting both tries for a half-time score of Falkirk 0 Musselburgh 14. 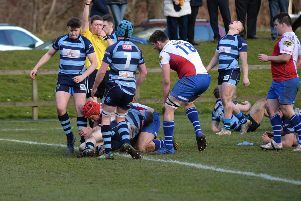 Applying themselves much more positively after the break bore fruit for the Sunnysiders as they went on to score two tries in the opening five minutes, the first coming about when Number Eight Ryan Howie intercepted the ball on midfield and stormed towards the visitors’try line. However he was dragged down short of the line but slick recycling saw Captain Stewart McCulloch snap up the ball and charge over for a well taken team try. Two minutes later Falkirk were yet again in the ascendancy when Stand-Off Glen Faulds put in a neat grubber-kick inside ‘Burgh’s 22 metre area and showed a clean pair of heels by winning the race for the touchdown. Falkirk’s forwards fought their way into ‘Burgh’s last quarter of the field and released to the back division for Glen Faulds to put in another low kick through for his brother Connor to latch onto as he gleefully raced through for the touchdown, with Glen also converting all three second half tries. Rugby club savours first win - at last!